Antique jewelry is special in its own right, and every piece has a story to tell that makes it even more unique. When you have an antique piece of jewelry, you want to keep it in good condition so that it can continue to be passed down through generations and continue to tell its story. It is just as important to know what not to do with these one of a kind pieces, to maintain the beauty of your antique jewelry. When you inherit jewelry from a loved one, a good first step is to find a local Arizona jeweler and estate jewelry appraiser. Some materials used in older jewelry can break down, prongs can break, and stones can be lost if proper care isn’t taken to maintain each piece. Getting an appraisal on your antique jewelry is fun, and can be useful if you decide to get insurance on your piece. After you’ve had your jewelry inspected and appraised, it’s time to make sure you treat it with care, and, of course, enjoy it! Wear your heirloom jewelry to the gym. You don’t want to take a chance that your pieces will get banged up on weight benches or caught on your clothes when moving around the gym. Protect your antique jewelry from the dirt, sweat, and iron found at the gym. Wear your antique jewelry while cooking and cleaning. When you’re cleaning the bathrooms, pools, or ovens, make sure to remove your heirloom jewelry and keep it clear of harsh chemicals that could damage or discolor it. When in the kitchen, you don’t want to take a chance that one of your precious stones fall out of your jewelry and into your mashed potatoes. Keep your antique jewels in direct sunlight, cold, or humidity. The Arizona sun can be brutal, so take care that you don’t overexpose your antique pieces to the elements. Use salt water or ultrasonic cleaners. Salt is a corrosive substance that can damage different materials. And although ultrasonic cleaners are good for modern jewelry pieces, you should not use them for your more fragile, antique pieces. Have your antique jewelry fitted by a certified Arizona jeweler. When you inherit your heirloom jewelry, you want to be able to show it off! It’s a bummer when the piece is either too big or too small to wear immediately. Taking it to a certified jeweler will help to determine whether the piece can be sized, as some heirloom jewelry may not be able to be. Your jeweler will be able to examine the piece and make recommendations to your specific needs. Store your special jewelry in a special jewelry box. You don’t want new scratches, dents, or bends in your heirloom jewelry. Make sure to make a special place away from your other jewelry for these special pieces. You don’t want to use harsh chemicals on these more susceptible materials. You may cause discoloration, or damage to certain metals and materials used in older pieces. Have your antique jewelry cleaned at a certified jeweler to insure it is taken care of in the most careful way. Occasionally, you should gently wipe the jewelry with a damp, lint free cloth to remove dust and dirt. Have your heirloom jewelry examined. You should take your jewelry in periodically to have the prongs and metals examined for damage. Set yourself a schedule with your estate jewelry appraiser in AZ to bring your piece or pieces in to maintain the integrity of your jewelry. Don’t be afraid to show these special pieces off. Whether it’s a new, every day piece for you, or something you adorn for a special occasion, wear these pieces and add more pages to their stories! 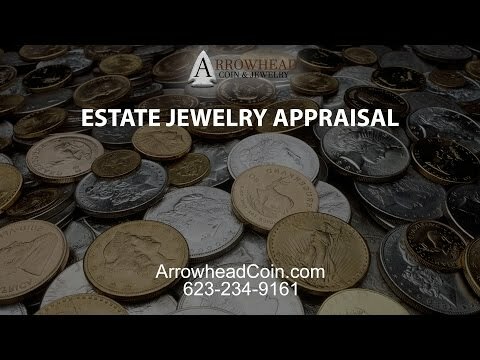 If you have a piece that you have decided that you would like to sell, Arrowhead Coin and Jewelry would love the opportunity to offer you a fair price on your heirloom jewelry. We have a very knowledgeable staff who are ready to offer cash to clients for their old jewelry. We would love to set up an appointment with you to see your antique pieces and discuss your plans for your unique, antique jewelry.